Runners will love these inspirational stories about their sport -- the camaraderie, the self-discipline, the energy and endorphins they enjoy, the self-discovery. Includes stories on swimming and cycling for triathletes too.When runners aren't running, they are talking about running, planning their next run, shopping for running... 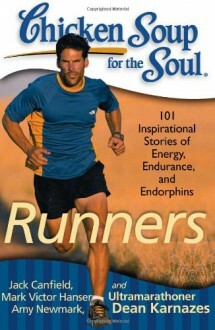 This book contains 101 stories from everyday and famous runners... telling their stories to other runners... about how running has improved their lives, recovering from injuries, challenging themselves, and includes amazing stories of marathons, camaraderie, and the natural high that comes from this popular sport. Plenty of stories for triathletes too, covering swimming and cycling.